As the June 30 deadline for negotiations with Iran over its nuclear program approaches, a new survey conducted in a red state (Oklahoma), a blue state (Maryland) and a swing state (Virginia) finds large bipartisan majorities in all three support making a deal with Iran rather than pursuing more sanctions. 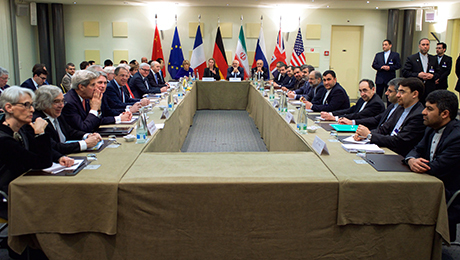 Congressional debate has intensified on whether the United States should agree to a deal that would allow Iran to have a limited uranium enrichment program or ramp up sanctions to press Iran to give up all enrichment activities. When representative samples of voters were briefed on the debate and evaluated multiple arguments for both sides, majorities came down in favor of making a deal in Oklahoma (73 percent), Maryland (74 percent), and Virginia (75 percent). While support was stronger among Democrats, in all cases a majority of Republicans and independents approved as well. Citizen Cabinet surveys are sponsored by Voice Of the People, a nonpartisan organization working to help give Americans a more effective voice in government. They are conducted by the Program for Public Consultation, a part of the School of Public Policy at the University of Maryland. In Oklahoma, a total sample of 615 registered voters, including a statewide sample of 479 voters (margin of error +/- 4.5 percent). The 4th Congressional District was also oversampled bringing the total to 232 (margin of error +/- 6.5 percent). In Maryland, a total sample of 626 registered voters, including a statewide sample of 475 voters (margin of error +/- 4.5 percent). The 7th Congressional District was also oversampled bringing the total to 210 (margin of error +/- 6.8 percent). In Virginia, a statewide sample of 513 voters (margin of error +/- 4.4 percent). The methodology used in Citizen Cabinet surveys goes beyond that of standard polls. The surveys – called ‘policymaking simulations’ – seek to replicate the process that policymakers go through when making a policy decision. All survey content is vetted in advance with experts from both parties. This survey was developed in close consultation with Republican and Democratic Congressional staff experts on the negotiations over Iran’s nuclear enrichment program, as well as various think tanks and advocacy groups with differing views on the issue, who reviewed all the content in advance to ensure that the briefing materials were accurate and that the strongest arguments for and against each option were presented. Once the Cabinet goes through the policymaking simulation, it is made available online at www.vop.org, so any citizen can go through the same process, learn about the issue, make their own recommendations and send them to their representatives in Congress.